When out and about, we tend to take Britain’s nature for granted. Asides from those of us with allergies to wasp and bee stings, we view the countryside as a safe place. However, there is a dangerous species of plant which grows in many places, including along urban waterways and footpaths and in parks and wasteland: Giant Hogweed. This hazardous weed was introduced to Britain in the 19th century as an ornamental plant, but this proved to be a mistake; Giant Hogweed is highly invasive and has spread across the country. Growing up to five metres tall, the plant features a thick green stem with white hairs. It produces white flowers clustered in an umbrella-like head. The plant is toxic upon contact with human skin, causing injuries akin to severe burns when exposed to sunlight. People should avoid all contact with it if possible. The bad news is, in the current heatwave its thriving. The plant’s sap contains chemicals which, when in contact with human skin, react with light, causing phytophotodermatitis. Once activated by sunlight, the chemicals cause extensive DNA damage, resulting in severe blisters and scarring. The skin turns red and starts itching, and as the burning worsens, blisters usually form within 48 hours. Giant Hogweed burns leave scars that can last for years. It can also result in long-term sensitivity to sunlight. If the plant comes into contact with eyes, it can cause temporary blindness. 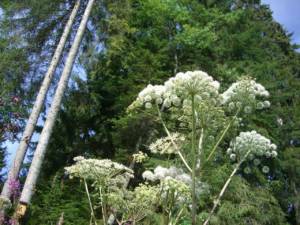 What should I do if I touch Giant Hogweed? The burns after contact with Giant Hogweed become second and third-degree burns very quickly, and become worse the longer the affected area is exposed to UV rays. As a result, it’s advised that you protect the affected area from light exposure immediately. Wash it with soap and water as soon as possible and then continue to cover the affected area for at least a few days to prevent any chemicals which have penetrated the skin from activating. Any blisters tend to heal very slowly, and sufferers may develop a skin rash that flares up in sunlight long after initial contact. The best thing to do is avoid Giant Hogweed entirely, and to be especially vigilant when with children. If you or your child feels ill or develops severe burns after suspected contact with Giant Hogweed, seek medical advice. If you want to learn how to give essential first aid to people in a wide variety of scenarios, take a look at our first aid courses running in locations across London and in Dunstable.